After a period of rapid development, the company needed to expand and increase competitiveness. To reach this goal, Raymond Weil’s son-in-law Olivier Bernheim joined what was to become a family business in 1982. He modernized its structure and organization, developed numerous markets, and took in charge the communication and marketing departments. His arrival reinforced the idea of an independent family-owned company dear to Mr Weil. Olivier Bernheim was to become President & CEO in 1996. The Brand was always influenced and inspired by music, and this was reflected in collection names as early as 1983 when the Amadeus collection, named after the classical Austrian composer, Mozart, was launched in conjunction with Milos Forman’s world acclaimed film of the same name. Music-inspired collection names were to become a distinguishing feature of the Brand’s identity and more were soon to follow: Fidelio -named after Beethoven’s only opera – Traviata or Saxo. More cult collections have shaped the brand’s personality: Toccata, the feminine collection Fantasia, and the emblematic Othello – a blend of avant-garde technology and refined design with its ultra-thin timepieces and created 1986 to celebrate RAYMOND WEIL’s tenth anniversary. A new step was marked in the early nineties for RAYMOND WEIL’s growth in the Swiss luxury watchmaking industry with the launch of the gents and ladies’ Parsifal collection: an original blend of complications, noble materials, meticulous finish and innovative designs. Tango, a blend of functionality and aesthetics with perfectly proportioned round or rectangular cases received immediate international acclaim. Tradition, another emblematic collection, was created at the same period with a classical and refined style embodying the watchmaking heritage in its most uncluttered version. Advertising-wise, RAYMOND WEIL carefully consolidated its commitment to the arts through its various communication actions, and in 1994, the award-winning Precision Movements advertising campaign portraying dancers in mid-air further established the Brand’s identity. In 2006, for the 30th anniversary of the Brand, Elie and Pierre Bernheim – RAYMOND WEIL’s 3rd generation – joined the company, ensuring family continuity and therefore equilibrium, stability and durability. Willing to add their own vision and know-how, they focused on the development of contemporary and technologically evolved collections that were to become huge successes. The exclusively masculine and high-tech Nabucco is the Brand’s first collection to bear an imposing 46mm case as well as a water-resistance of 200m and at the same time integrating a sophisticated material: carbon fibre. A split-second chronograph with power-reserve indicator – a first for the company – was fitted in the Nabucco Cuore Caldo, an exclusive limited edition of 500 pieces. The Freelancer mechanical collection for gents and ladies heralds two innovations in the brand’s history: the introduction of the visible balance-wheel; and the creation of a mechanical range of ladies’ timepieces. Ladies were also offered their own collection in 2009: Noemia. With its soft curves and precious materials, it has been charming women the world over ever since. Further watchmaking know-how and technical expertise were put into the Maestro collection created a year later, especially into additions like the Maestro phase de lune – the Brand’s first moon phase complication on an automatic mechanism – and the Maestro Phase de Lune Semainier boasting complications such as date, day, month, week number and moon phase added to an automatic movement generating a 42 hour power reserve. The usability of these timepieces was attended to with great care and innovative push-buttons were fitted onto the casing to allow an easy setup without the need of any tool. 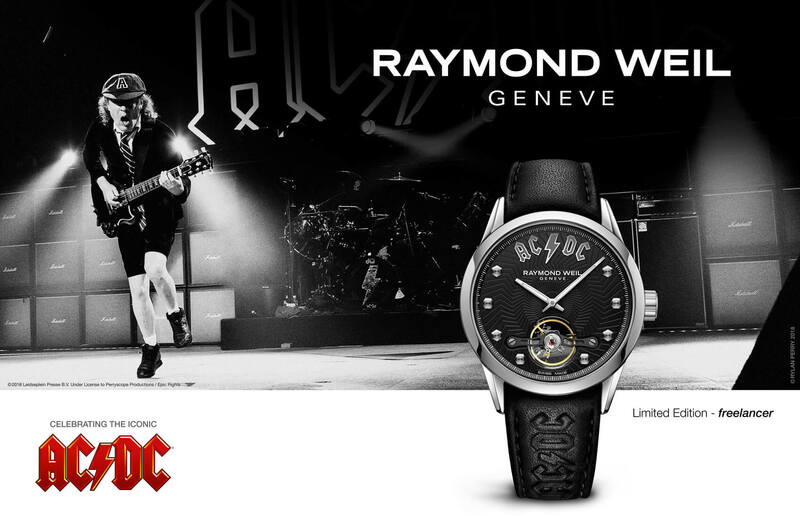 During the same period, RAYMOND WEIL strengthened its commitment with the music industry, building strong partnerships with major musical events such as the BRIT Awards – one of the most glamorous and widely-recognized events in the music business – for which the Brand has been an Official partner since 2008. Celebrating the Brand’s 35th anniversary, the feminine collection, Jasmine, was successfully launched. 2011 saw the launch of a new advertising campaign and tagline: Precision is my Inspiration. The campaign features watches worn by models in the luxurious and refined atmosphere of the Victoria concert hall in Geneva and keeps with the Brand’s dynamic and innovative spirit. It revolved around music – RAYMOND WEIL’s constant source of inspiration. 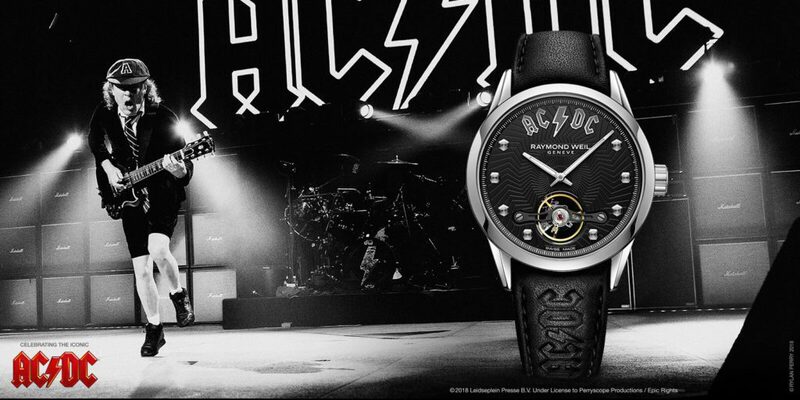 A year later, RAYMOND WEIL proposed a completely new demonstration of its musical and artistic influences with a campaign using strikingly beautiful images – musical scores taking off, revealing the Brand’s watch creations, illuminated by a halo of light. A campaign rich in allusions to the image of a brand that occupies a unique place in the luxury watch industry. Music was to become ever more important for the brand with 2013 being a year rich in music partnerships and events. The Brand designed an impressive booth for the Baselworld fair – the world’s biggest watch and jewellery show – in the form of a 9 meter high cello, the world’s biggest solid wood cello. Strong partnerships with iconic venues like the Royal Albert were tied in addition to renewed alliances with charities of the like of VH1 Save The Music Foundation, ACMF and Nordoff Robbins and glamorous events like the BRIT Awards. The Music Icons series campaign was launched celebrating unique artists and brands such as Frank Sinatra, Gibson guitars, Sennheiser and Nicola Benedetti. 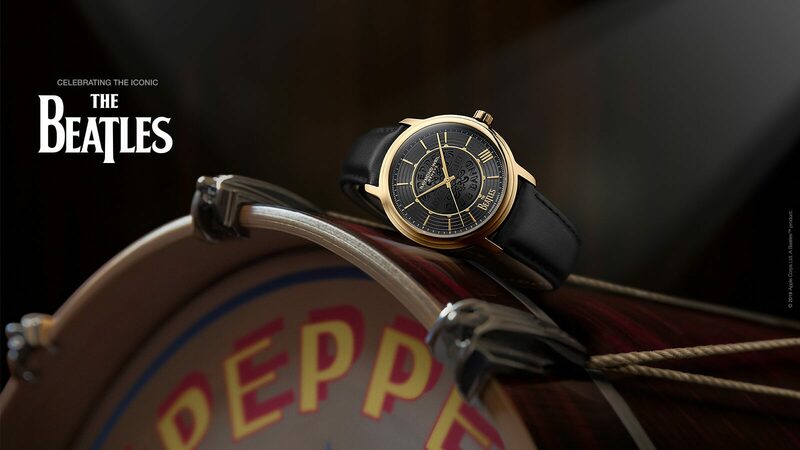 RAYMOND WEIL celebrated its 40th anniversary with the Fab Four and a new maestro The Beatles limited edition followed by limited edition for Buddy Holly and the iconic David Bowie. Inspiration, creativity and most of all innovation were celebrated with milestones for the brand such as its first tourbillon, a unique patented interchangeable bracelet system for the shine collection showcased partnership with French maison Repetto Paris and the development its first in-house movement creation with the Calibre RW1212. The Geneva Company brings out watchmaking excellence and music inspiration staying more than ever true to its motto: Precision Movements. Elie Bernheim joined the company in 2006 after graduating from the prestigious Ecole Hôtelière de Lausanne. As third generation of the family-owned company, Elie – grandson of Mr. Raymond Weil – ensures the continuity of the Brand’s heritage based on watchmaking know-how and the ongoing adherence to its values. Proficient in watchmaking, marketing and business management, during recent years, Elie has been in charge of developing and enhancing the global strategy of RAYMOND WEIL. It was in the context of a continuing respect for this heritage firmly entrusted to him, which has constituted the cornerstone of the remarkable success of this watchmaking Brand over the years, that Elie Bernheim embarked on his career in the company. His sense of traditional values, combined with a young and fresh vision, make him the perfect candidate to manage the Brand’s corporate image, communications and social networks, thus enabling RAYMOND WEIL to get closer to its clients in a new and interactive way. Thanks to his curiosity and enthusiasm, he has acquired an in-depth knowledge of the markets, resulting today in his excellent contacts with the Brand’s partners. Elie Bernheim was appointed CEO of RAYMOND WEIL in April 2014, succeeding his father, Olivier Bernheim, who joined the family company in 1982, becoming its President and CEO in 1996. As a well-informed music-lover, he perfected the piano, before specialising in the cello. Essentially acquired from his mother, a professional pianist, the passion for music is today a second inspiration, influencing every new product development or marketing orientation at RAYMOND WEIL. A few years after the creation of RAYMOND WEIL and at the request of his father-in-law, Mr Raymond Weil, Olivier Bernheim joined the watch company in 1982. It is thanks to his dynamism and visionary entrepreneurial spirit, but also to his ability to maintain excellent and longstanding relationships with partners of RAYMOND WEIL, that Olivier Bernheim, President and CEO of the Brand, restructured, developed and ensured a sustainable growth throughout the world, still managing to preserve its family identity. His strategy contributed to RAYMOND WEIL’s impact on the watchmaking world. Key factors in the firm’s success include a significant Brand expansion throughout the world, a constant renewal of the product range – with the introduction of new, increasingly sophisticated mechanical timepieces -, the development of entry-level collections, and a wider-reaching communication strategy. Beyond his tenacity to keep RAYMOND WEIL independent, Olivier Bernheim’s plans for the upcoming years are to increase the Brand’s recognition in mature markets such as Europe, Asia and North-America. He also wishes to reinforce the Brand’s presence in key markets such as China, India and Russia, which represent huge potential, through shop in shops and exclusive boutiques. On a personal level, his private life follows the same rhythm as his business life. Olivier shares his love for music with his whole family and always tries to find some time to dream by listening to operas. His definition of luxury? Spending some time with his family and enjoying his passion for nature.